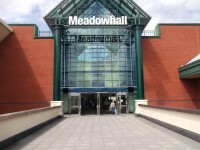 Meadowhall covers 1.5 million square feet of floor space and contains 280 stores from top independent and international brands. 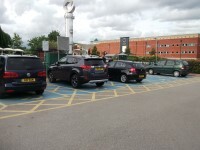 There are 12,000 free parking spaces, of which 346 are Blue Badge bays. 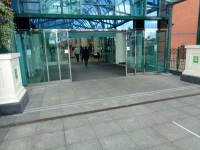 There is direct access to the centre via rail, road and tram. 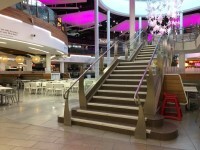 Customers can pre-arrange a meet and greet service by calling 0114 256 8800. 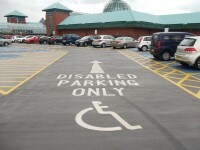 Wheelchairs and assistance are available by request with 48 hours notice. . 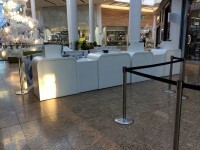 The team are trained in evac-chair procedures and have evacuation chairs located around the centre. 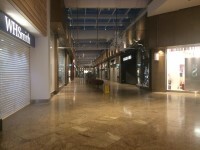 You are on Opening Times (Mall). Skip to the next section. 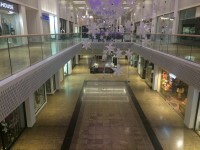 Extended opening times operate throughout the Christmas period. 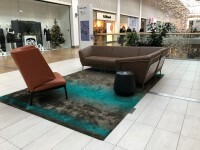 Please contact the shopping centre, or visit their website, for more information. 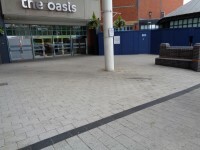 You are on Opening Times (Oasis Dining Quarter). Skip to the next section. You are on Opening Times (Management Suite). Skip to the next section. 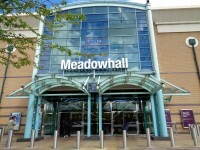 The nearest National Rail station is Meadowhall Interchange. There is a tram stop within 150m (164yds) of the venue. 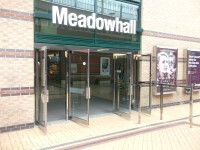 The name of the nearest tram stop is Meadowhall Interchange. You are on Parking (Orange Car Park). Skip to the next section. 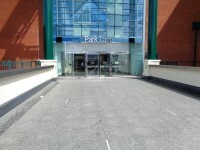 The car park is located in front and to the side of the venue. 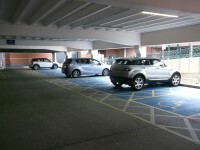 There is/are 103 designated parking bay(s) within the car park. 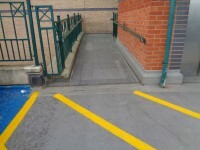 The dimensions of the designated parking bay(s) are 500cm x 565cm (16ft 5in x 18ft 6in). 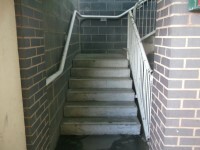 The nearest designated bay is 15m (16yd 1ft) from the Lower High Street entrance. 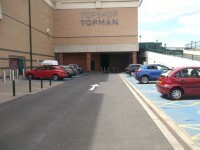 The furthest designated bay is 78m (85yd 11in) from the Lower High Street entrance. 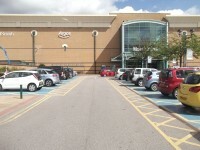 The drop off point is located within the Orange Car Park. There is a dropped kerb from the drop off point. There is not tactile paving on the dropped kerb. 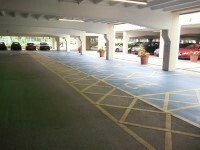 5 of the 103 Blue Badge bays within the Orange Car Park are located 39m from the Oasis Dining Quarter entrance. 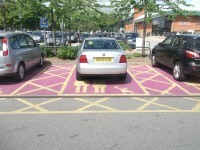 Parent and child bays are also available on the next rows of parking from the Blue Badge bays. 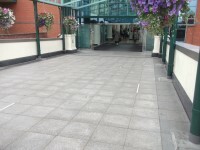 Photo's 6 and 7 show the drop off point located to the right of the entrance and the dropped kerb leading to the entrance. Photo 8 shows the drop off point located near to the Oasis Dining Quarter entrance. 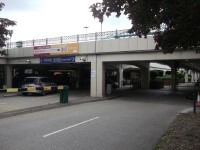 The orange car park serves the Lower High Street, Oasis and the Oasis Dining entrances. 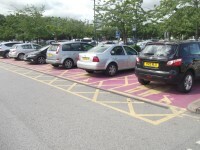 You are on Parking (Pink Car Park). Skip to the next section. 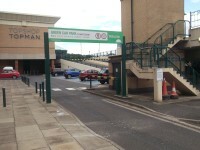 The car park is located to the rear of the venue. 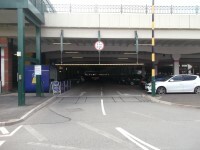 There is/are 65 designated parking bay(s) within the car park. 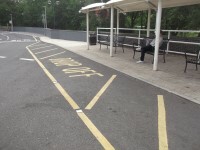 The dimensions of the designated parking bay(s) are 490cm x 580cm (16ft 1in x 19ft). 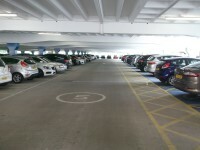 There are 98 designated Blue Badge bays located within the Pink Car Park. 27 Blue Badge bays are located on the upper level, outside the atrium first floor entrance. 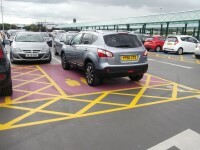 An additional 6 Blue Badge bays are located outside of the entrance to House of Fraser. 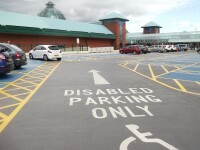 The remaining 65 Blue Badge bays are located on the lower level nearest to the atrium ground floor entrance. 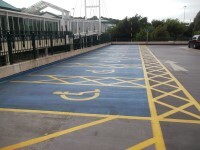 Parent and child parking spaces are available on both the upper and lower levels. 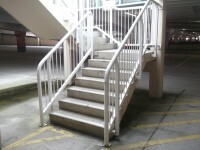 There are multiple staircases located within the car park. 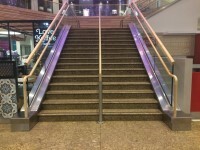 They have deep steps and handrails on both sides. 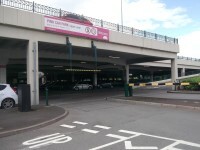 The Pink Car Park serves the atrium ground floor and first floor entrances. You are on Lift (Pink Car Park). Skip to the next section. 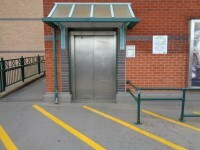 The lift is located to the rear of the car park. 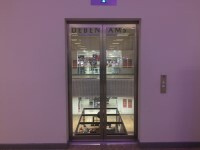 The lift is approximately 16m (17yd 1ft) from the atrium entrance. 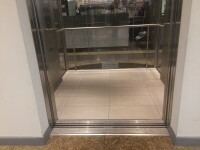 The clear door width is 110cm (3ft 7in). 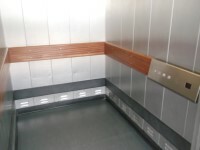 The dimensions of the lift are 130cm x 195cm (4ft 3in x 6ft 5in). 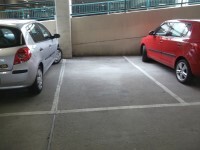 You are on Parking (Red Car Park). Skip to the next section. 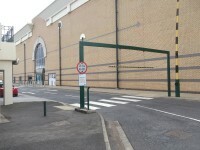 The car park is located to the side of the venue. 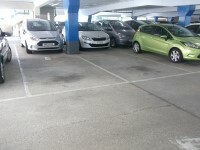 There is/are 54 designated parking bay(s) within the car park. The nearest designated bay is 31m (33yd 2ft) from the arcade entrance. 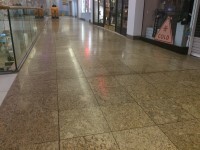 The furthest designated bay is 59m (64yd 1ft) from the arcade entrance. 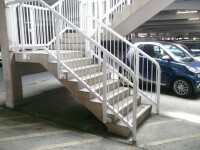 There are multiple staircases located on the lower level of the car park. 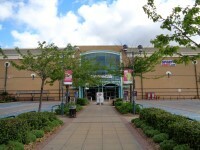 The Red Car Park serves the arcade entrance. You are on Lift (Red Car Park). Skip to the next section. 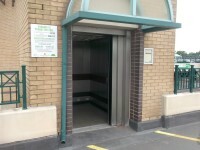 The lift is located at the rear of the car park. 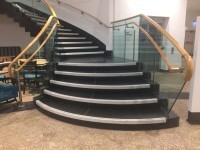 The lift is approximately 65m (71yd 3in) from the High Street entrance. 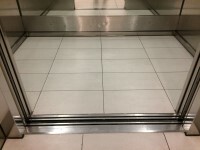 The dimensions of the lift are 134cm x 190cm (4ft 5in x 6ft 3in). The clear door width is 115cm (3ft 9in). You are on Parking (Yellow Car Park). Skip to the next section. 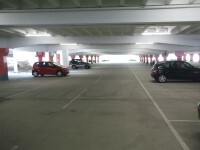 There is/are 51 designated parking bay(s) within the car park. The nearest designated bay is 34m (37yd 7in) from the arcade entrance. 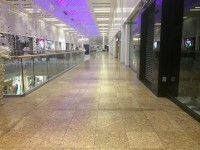 The furthest designated bay is 63m (68yd 2ft) from the arcade entrance. 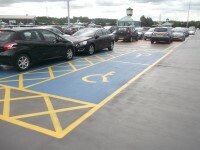 There are 51 designated Blue Badge bays located within the Yellow Car Park. 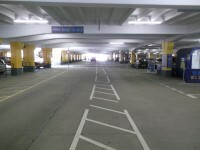 The Blue Badge bays are all located on the upper level. 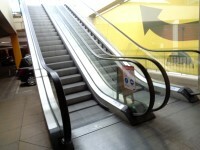 A set of escalators lead from the lower level of the Yellow Car Park to the pathway leading to the arcade entrance. 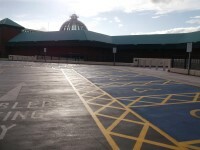 The Yellow Car Park serves the Park Lane and arcade entrances. You are on Lift (Yellow Car Park). Skip to the next section. 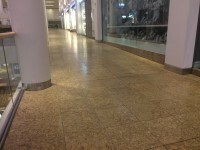 The lift is approximately 45m (49yd 8in) from the Arcade entrance. 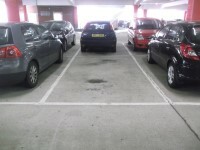 You are on Parking (Blue Car Park). Skip to the next section. 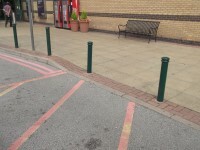 There is/are 18 designated parking bay(s) within the car park. 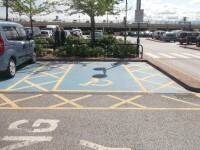 There are 18 designated Blue Badge bays located within the Blue Car Park. 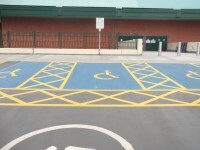 The Blue Badge bays are all located on the lower level. 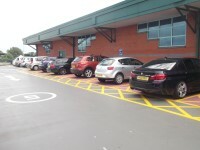 Parent and child parking spaces are available on the lower level. 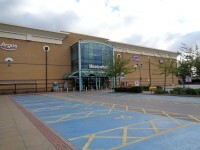 The Blue Car Park serves the Park Lane entrance. You are on Lift (Blue Car Park). Skip to the next section. 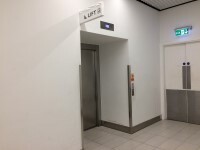 The lift is located at the front of the car park. 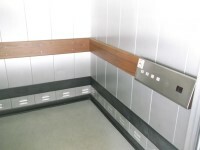 The controls for the lift are within 120cm from the floor. 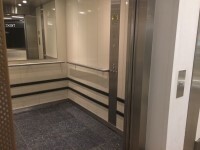 The lighting levels in the lift are medium. 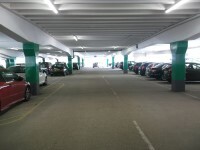 You are on Parking (Green Car Park). Skip to the next section. 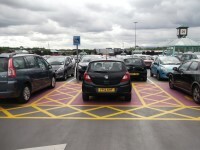 There is/are 21 designated parking bay(s) within the car park. The nearest designated bay is 63m (68yd 2ft) from the Park Lane entrance. 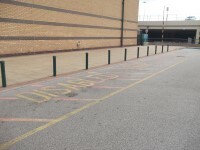 The furthest designated bay is 74m (80yd 2ft) from the Park Lane entrance. 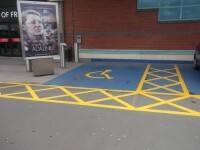 There are 21 designated Blue Badge bays located within the Green Car Park. 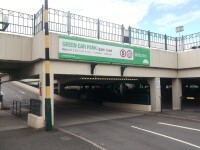 The Green Car Park serves the Park Lane entrance. You are on Lift (Green Car Park). Skip to the next section. 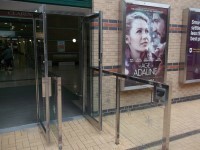 You are on Outside Access (Lower High Street Entrance). Skip to the next section. This information is for the entrance located off of the orange car park. The door opening is 100cm (3ft 3in) wide. 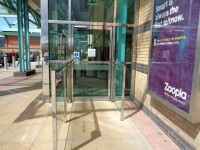 The automatic door detailed above is located at the side of the entrance. 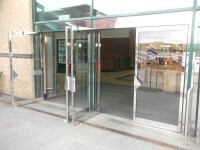 There are two sets of double manual doors located at the front of the entrance. The doors are heavy and open towards you. The doors are 210cm wide. 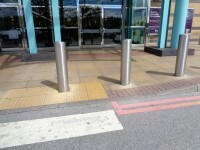 There is a line of bollards located across the front of the entrance. You are on Level Change (Lower High Street Entrance). Skip to the next section. 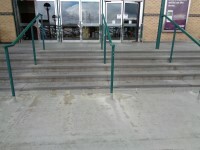 The ramp/slope is located leading to the entrance. 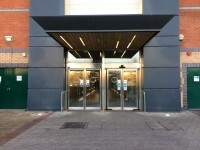 You are on Outside Access (High Street Entrance). Skip to the next section. 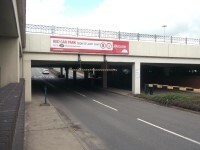 This information is for the entrance located on the upper level leading from Red Car Park. 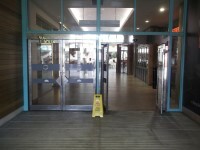 To the left of the automatic door are two sets of double manual doors and a single manual door. They open towards you and are heavy. The single door is 85cm wide. 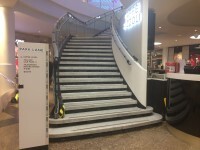 You are on Level Change (High Street Entrance). Skip to the next section. 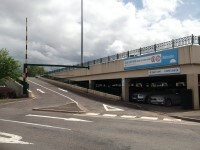 The ramp or slope is located between the car park and the entrance. 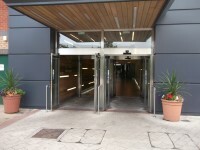 You are on Outside Access (Oasis Dining Quarter Entrance). Skip to the next section. This information is for the entrance located on the west side of the building. The width of the door opening is 155cm (5ft 1in). 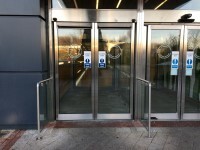 There are 2 similar sets of doors at this entrance. The doors surveyed were on the left hand side of the entrance. You are on Level Change (The Oasis Entrance). Skip to the next section. 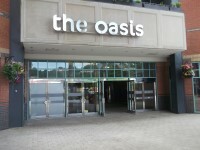 You are on Outside Access (The Oasis Entrance). Skip to the next section. 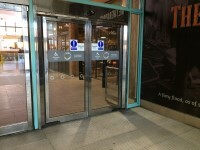 The automatic doors are located to the right of the entrance. 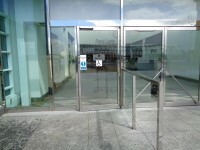 There are a set of manual doors to the left of the entrance. They open towards you, are double width and heavy. The doors are 187cm wide. There is an identical second set of doors after you enter. 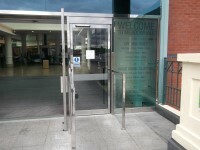 You are on Outside Access (The Atrium Ground Floor Entrance). Skip to the next section. 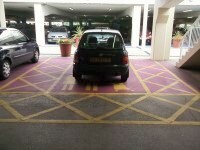 This information is for the entrance located off the Pink Car Park on the ground floor. 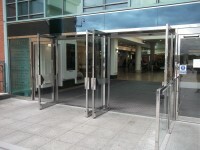 The automatic doors are located on the right of the entrance. 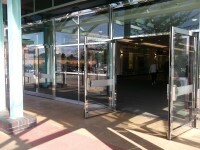 To the left of the automatic doors are two sets of manual doors. 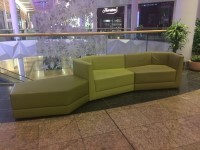 The first set are double width, open towards you and are 166cm wide. The second is a single, heavy door that opens towards you and is 80cm wide. You are on Level Change (The Atrium Ground Floor Entrance). Skip to the next section. 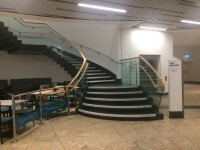 You are on Outside Access (The Atrium First Floor Entrance). Skip to the next section. 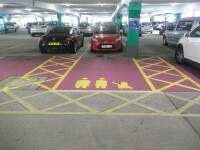 This information is for the entrance located on the upper level of the Pink Car Park. The main door(s) open automatically. 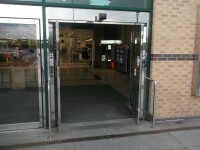 To the left of the automatic doors are two sets of double width manual doors. They open towards you, are heavy and 190cm wide. You are on Level Change (The Atrium First Floor Entrance). Skip to the next section. You are on Outside Access (Park Lane). Skip to the next section. 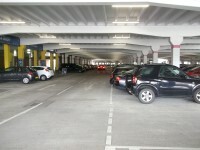 This information is for the entrance located on the upper level of the Yellow Car Park. 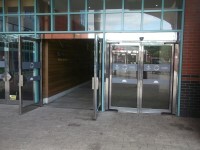 The automatic door is located on the left of the entrance. 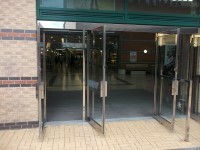 To the right of the automatic doors are two sets of manual doors. 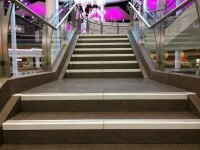 The first set are double width, open towards you and are 204cm wide. The second is a single, heavy door that opens towards you and is 100cm wide. You are on Level Change (Park Lane). Skip to the next section. 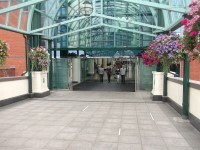 You are on Outside Access (The Arcade Entrance). Skip to the next section. 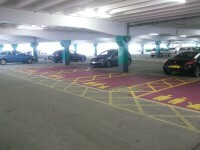 This information is for the entrance located on the upper level leading from the Red and Yellow Car Parks. You are on Level Change (The Arcade Entrance). Skip to the next section. 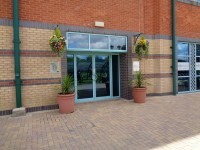 You are on Outside Access (Management Suite Entrance). Skip to the next section. You are on Reception (Management Suite). Skip to the next section. 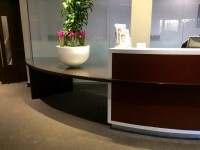 The desk/counter is 5m (5yd 1ft) from the Management Suite entrance. 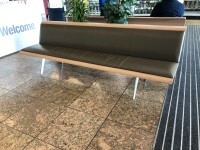 There is seating available in the reception area. 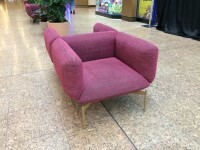 Some of the seating has armrests. 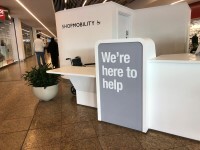 You are on Reception (Customer Service Mobility Desk). Skip to the next section. 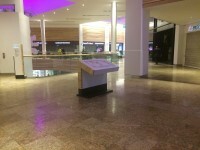 The desk/counter is 29m (31yd 2ft) from the Lower High Street entrance. 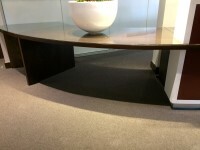 The desk has a low section (76cm or lower). Team members are trained to use the hearing assistance system. 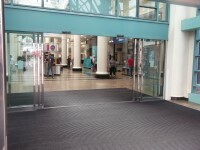 This service provides information and mobility aids for the shopping centre. 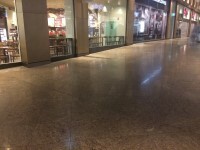 Wheelchairs and mobility scooters can be hired here. 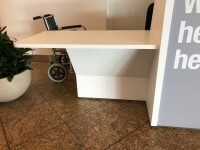 Wheelchairs are hired on a first come, first serve basis. Personal identification is required to hire a wheelchair. Mobility scooters are booked in advance. Personal identification is required to hire a scooter. 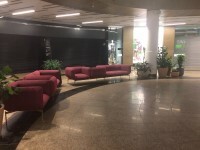 There is seating within this area. The seats do not have armrests. You are on Reception (Customer Service). Skip to the next section. 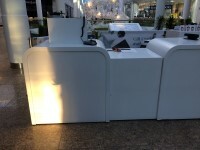 The desk/counter is 18m (19yd 2ft) from the arcade entrance. 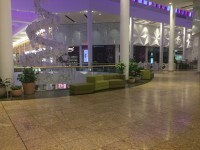 There is a variety of seating throughout the mall. 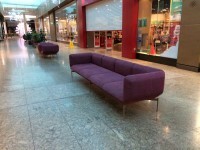 Some of the seating is sofas with armrests. 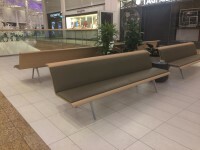 Some of the seating is bench seating without armrests. 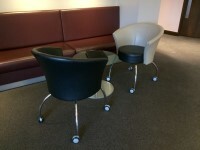 Some of the seating is chairs with armrests on both sides. 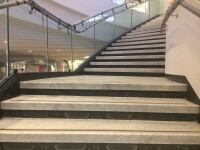 You are on Level Change (Main Walkways). Skip to the next section. 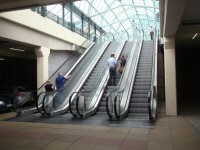 There are moderate slopes located along the walkways on both the upper and lower levels. You are on Quiet Room. Skip to the next section. 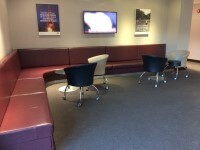 The quiet room is located on the ground floor, to the right hand side of the Management Suite. It is 7m from the Management Suite. 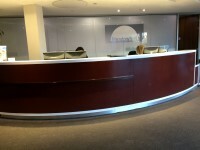 Please contact the Management Suite reception for access. The quiet room can be used for prayer and quiet contemplation. 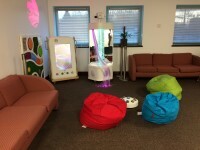 There is a variety of sensory equipment in the quiet room. 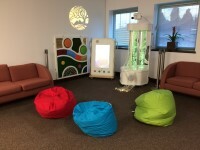 There is tactile equipment, soft beanbags, and equipment with visual stimuli. The lighting levels in the room are medium. You are on Other Floors (Centre). Skip to the next section. 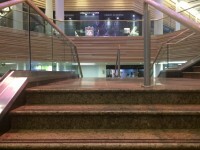 The floors which are accessible by escalator are G and 1. 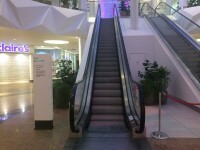 The escalators steps are clearly marked. 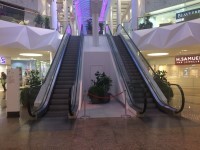 The foot and head of the escalators are not clearly marked. You are on Other Floors (Rear of the Centre). Skip to the next section. You are on Lift (Park Lane). Skip to the next section. 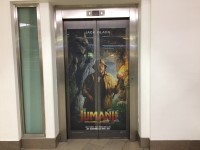 The lift is located ahead as you enter the Park Lane entrance. 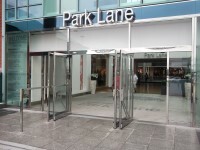 The lift is approximately 18m (19yd 2ft) from the Park Lane entrance. 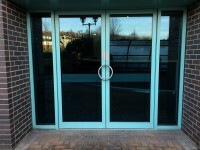 The clear door width is 120cm (3ft 11in). 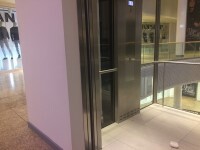 The dimensions of the lift are 195cm x 220cm (6ft 5in x 7ft 3in). You are on Lift (High Street). Skip to the next section. 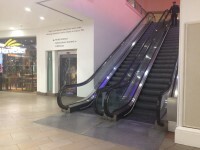 The lift is located ahead as you enter the High Street entrance. 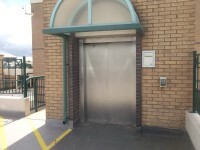 The lift is approximately 16m (17yd 1ft) from the High Street entrance. 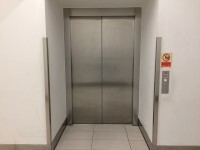 The dimensions of the lift are 175cm x 185cm (5ft 9in x 6ft 1in). You are on Lift (Oasis). Skip to the next section. 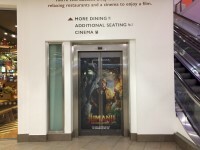 The lift is located to the left as you enter the Oasis Dining Quarter entrance. 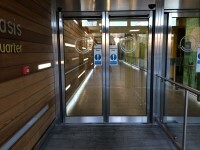 The lift is approximately 33m (36yd 3in) from the Oasis Dining Quarter entrance. 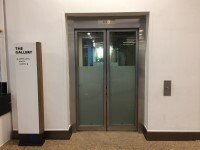 The dimensions of the lift are 170cm x 180cm (5ft 7in x 5ft 11in). 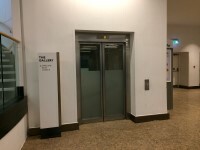 You are on Lift (The Gallery). Skip to the next section. 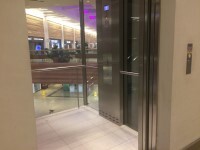 The lift is located off the Gallery. 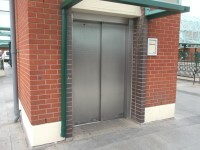 The lift is approximately 69m (75yd 1ft) from the Lower High Street entrance. 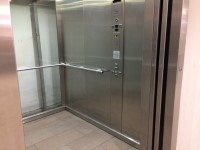 The dimensions of the lift are 130cm x 180cm (4ft 3in x 5ft 11in). 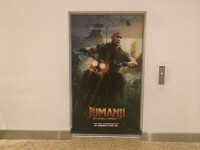 You are on Lift (Arcade). Skip to the next section. 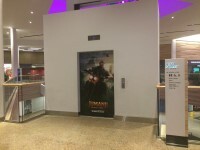 The lift is located off the Arcade, on the right hand side as you enter via the Arcade Entrance. 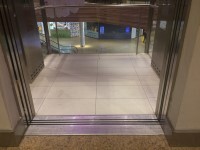 The lift is approximately 63m (68yd 2ft) from the Arcade entrance. 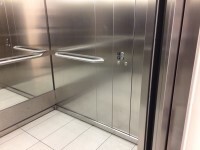 The dimensions of the lift are 120cm x 231cm (3ft 11in x 7ft 7in). 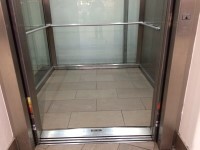 The clear door width is 151cm (4ft 11in). 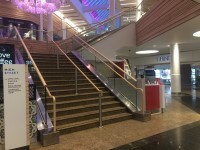 The facility is located to the right as you enter the Oasis Dining Quarter entrance. 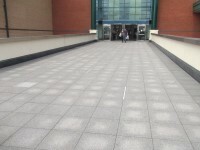 The facility is approximately 17m (18yd 1ft) from the Oasis Dining Quarter entrance. It is not a radar key. The key can be obtained from the management suite. The width of the door is 85cm (2ft 9in). The dimensions of the facility are 340cm x 405cm (11ft 2in x 13ft 3in). 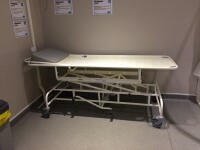 The length of the facility changing bench is 180cm (5ft 11in). The sling is attached to the hoist by hook. The facility toilet is corner. The transfer space on the left as you face the toilet is 120cm (3ft 11in). As you face the toilet the drop down rail(s) is/are on the left. 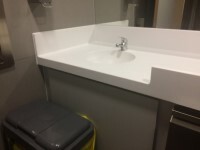 The type of wash basin is fixed. 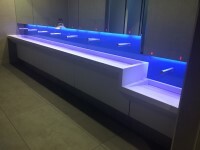 Wall mounted grab rails are available at the wash basin. As you face the wash basin, the wall mounted grab rails are on both sides. A privacy screen is not available. 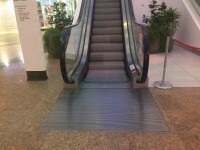 The facility has a non-slip floor. A functioning emergency alarm is not available. It is out of reach (higher than 10cm (4") from the floor). 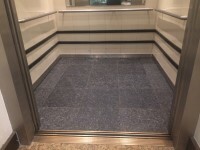 You are on Accessible Shower. Skip to the next section. 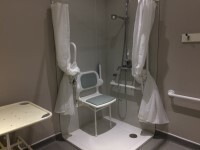 The accessible shower(s) surveyed is/are located within the changing places facility. 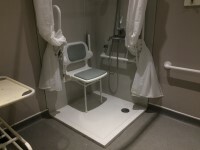 The facilities available in the accessible shower(s) include; an adjustable shower head and a flip-down seat. 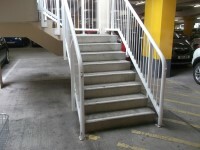 Other facilities available include; drop down rails on both sides. There is a 4cm shallow step to enter the shower. You are on Accessible Toilet (The Atrium). Skip to the next section. 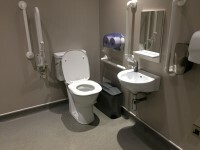 This accessible toilet is approximately 23m (25yd 6in) from the Atrium Ground Floor entrance. 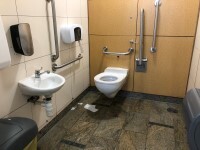 This accessible toilet is located on the ground floor, to the left as you enter the Atrium Ground Floor entrance. 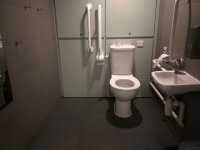 The dimensions of the accessible toilet are 145cm x 210cm (4ft 9in x 6ft 11in). 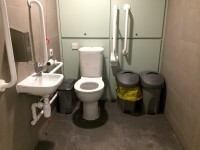 There is a similar accessible toilet with transfer space on the left next to this accessible toilet (shown in photographs 3 and 4). You are on Accessible Toilet (Oasis). Skip to the next section. 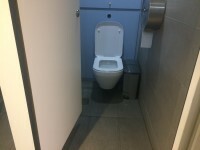 This accessible toilet is approximately 38m (41yd 1ft) from the lift. 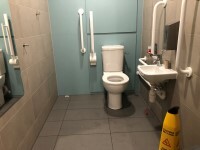 This accessible toilet is located on the first floor, to the left as you exit the lift, between Handmade Burger and Pizza Express. 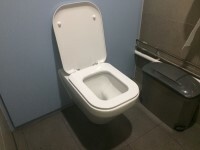 The dimensions of the accessible toilet are 147cm x 228cm (4ft 10in x 7ft 6in). The lateral transfer space is 77cm (2ft 6in). 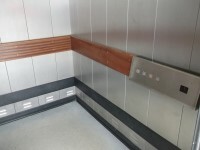 The height of the hand dryer is 103cm (3ft 5in). You are on Accessible Toilet (Park Lane). Skip to the next section. 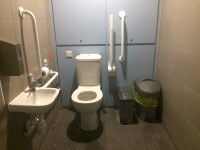 This accessible toilet is approximately 11m (12yd 1in) from the Park Lane entrance. 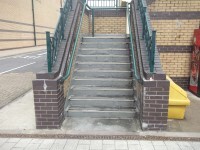 This accessible toilet is located to the left as you enter via the Park Lane entrance. 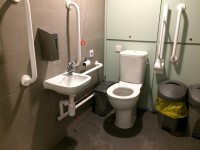 The dimensions of the accessible toilet are 152cm x 201cm (4ft 12in x 6ft 7in). 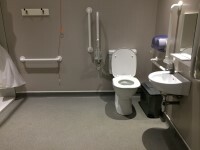 There is an additional accessible toilet with right hand transfer to the right of this toilet (shown in photographs 3 and 4). You are on Accessible Toilet (High Street). Skip to the next section. There is tactile and pictorial signage on or near the toilet door. 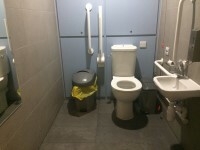 This accessible toilet is approximately 59m (64yd 1ft) from the Lower High Street entrance. 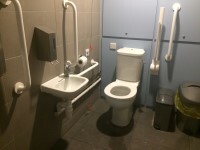 This accessible toilet is located on Lower High Street, to the left hand side as you enter via the Lower High Street entrance. 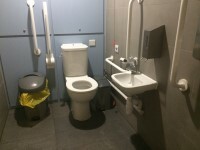 The dimensions of the accessible toilet are 150cm x 208cm (4ft 11in x 6ft 10in). The lateral transfer space is 82cm (2ft 8in). There is an emergency alarm in the cubicle. 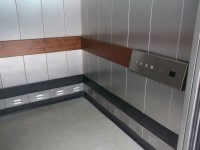 The height of the hand dryer is 105cm (3ft 5in). Baby changing facilities are not available within this accessible toilet. 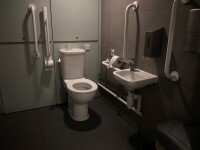 There is a similar accessible toilet with left hand transfer in the same location (shown in photographs 3 and 4). You are on Parent and Baby Room. Skip to the next section. 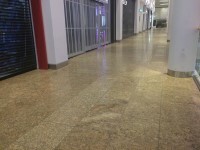 There are a number of parent and baby rooms throughout the shopping centre in the same locations as the accessible toilets and standard toilets. The rooms have a toilet with sink. 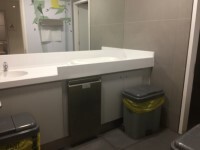 The rooms have a baby change area with sink. 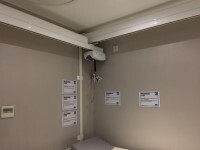 The height of the baby change facilities is 99cm. 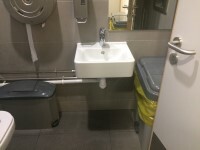 The height of the sinks is 90cm. 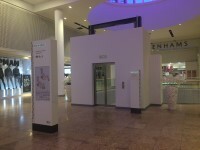 The female and male toilet facilities that were surveyed are located on the ground floor, to the left as you enter the Atrium. 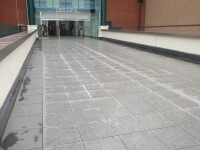 The female and male toilets are approximately 26m (28yd 1ft) from the Atrium Ground Floor entrance. 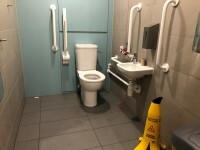 Additional standard toilets are available throughout the shopping centre in the same locations as the accessible toilets. 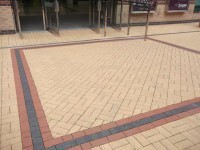 The assistance dog toilet area is located on the grass area around the shopping centre. Staff are Dementia Awareness trained.